All right you primitive screw heads, listen up. 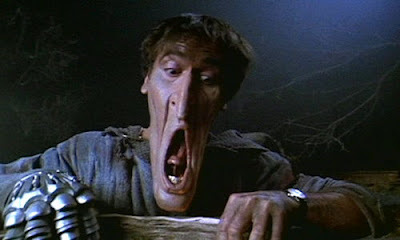 We’re reviewing Army of Darkness. 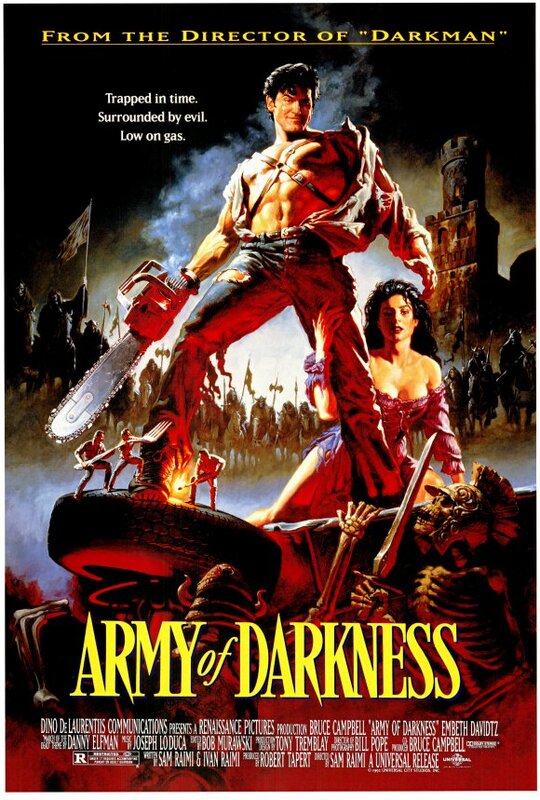 For those of you who are unfamiliar with Army of Darkness, let’s get you up to speed real quick. Army of Darkness is the third and best installment of the Evil Dead series. Ash, played by Bruce Campbell, lived a pretty good life, working in housewares at S-mart (“Shop smart, shop S-mart”), until he and his girlfriend Linda went to a cabin in the woods for the weekend. Unluckily for them, the cabin was being used by an archaeologist who was trying to translate the Necronomicon. The happy couple then accidentally released some evil spirit into the world. It possessed Linda and Ash’s hand forcing Ash to kill his girlfriend and cut off his own hand with a chainsaw. 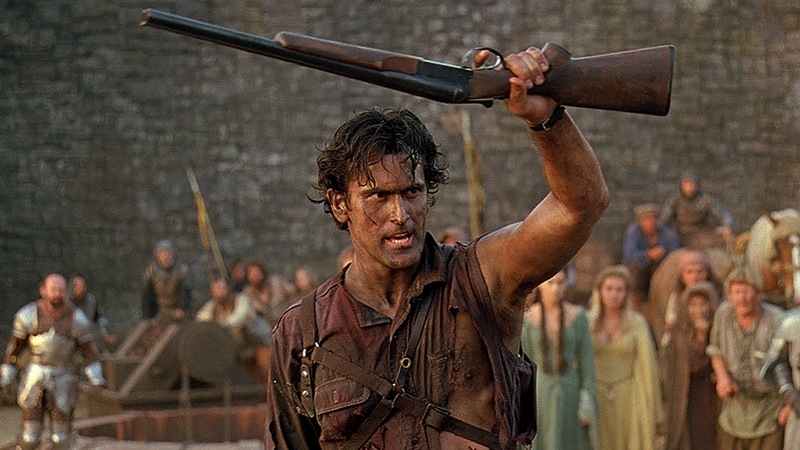 Eventually Ash gets sucked into a portal and thrown back into the year 1300, which is where Army of Darkness opens on our hero. Ash is quickly captured by Lord Arthur, and taken back to Arthur’s castle. There he gets to show off his technology (“This is my boomstick”). Soon it is discovered that Ash is the Chosen One and must go get the very same Necronomicon that sent him back in time. All he has to do is go to a cemetery, say the magic phrase “Klaatu barada nikto” (bonus points if you know where this originates), and grab the book. Of course, he screws up the phrase and ends up releasing the undead Deadite army. Ash returns to the castle with the book and helps its inhabitants prepare for the inevitable invasion. After a hard fought battle, the living are victorious and Ash is sent back either to the present or the far distant future, depending on the version of the film you watch (my copy has him going home). Things do not always go well for Ash. I am certain there was a point where the director and producer were trying to make a serious movie, but that went out the window pretty quickly. From that point on it’s a comedy, with a few horror elements mixed in. Bruce Campbell’s character absolutely makes this movie. Campbell plays the cheesy and not too bright Ash perfectly. It takes less than ten minutes for Ash to begin spouting his infamous one-liners. He is just confident enough to get himself into trouble and not realize how deep in he really is. Ash is a little like Indiana Jones, but not nearly as clever. The supporting cast is not terrible, filled with several B-list names whose performances don’t really stand out. I can’t say I blame them though, since they weren’t give a whole lot to work with. The whole movie is basically about Ash and the extra characters often just stand there to give him someone to talk to, when he isn’t just talking to himself. One cast member who is a personal favorite of mine is Ted Raimi, brother of director Sam Raimi. He has a short appearance in the alternate ending and as a Seaquest DSV fan, I’m always glad to see him on screen. There is a certain look to this film that B movie fans will recognize almost immediately. While not all of De Laurentiis’ films have this look, there are a number, like Conan the Barbarian, Red Sonja, and Barbarella that do. The effects are cheap and simple but effective. In one scene where Ash fights a group of miniature Ash-es, the effects team uses old school tricks such as filming actors in front of a projected image to accomplish the shots they need. 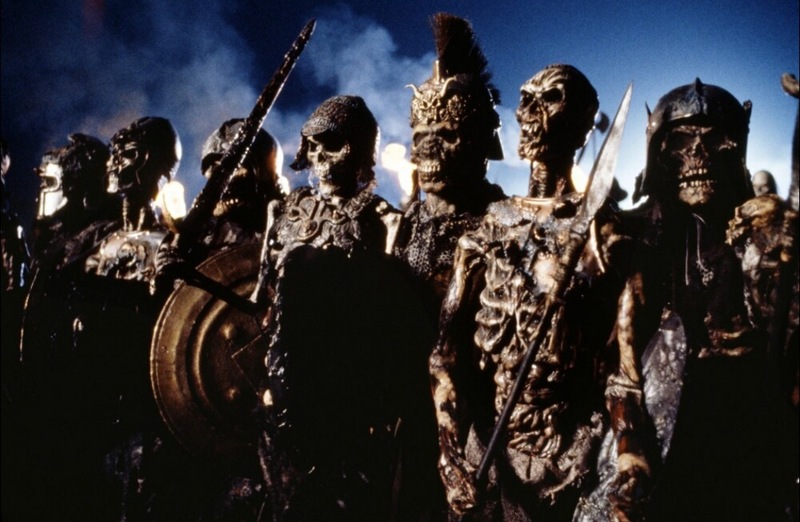 Another example is the Deadite army, which is a mixture of skeleton puppets and guys in spandex suits. The more impressive puppets are in the front of the shot and the costumed men are used where it would be impractical to have a puppet—such as running across the background of a shot. Most of the other effects stick to basic explosives and ordinary fire, but this doesn’t detract from the visual. The biggest problem with the movie is the painful dialogue. Don’t get me wrong, I absolutely love the one-liners, but these are pretty groan worthy, and they provide the only decent part of the script. Trying to speak in fourteenth century English makes most of the characters seem wooden and slow. The most annoying character, though, is Ash’s full grown duplicate, whose dialogue just gets on my nerves. Although also delivered by Campbell, the lines are just so much more over the top and goofy that they have a way of getting under my skin. This is one of the movies I love to quote, especially right after watching it. It’s also one of the movies that has cemented Bruce Campbell’s place as the king of B movies (“Hail to the king, baby”). I give this one four and a half Death Stars. Now give me some sugar. – Because everything’s better with Bruce Campbell. I never saw the other Evil Dead movies before I stumbled upon this at Blockbuster. It is badly written, badly acted, badly filmed, and one of the funniest movies I have ever seen. And also, Lord help me, I know where that “Klaatu barada nikto” comes from.